Situated in a highland mountain valley and cradled by dramatic, copper-toned, mountain cliffs, Tepoztlán is one of Mexico’s most alluring and unique colonial towns. With a breath-taking mountainous landscape, charming town center, rich echoes of ancient civilizations, and an interesting convergence of inhabitants, the town makes for one of the most remarkable mix of colonial and indigenous experiences in Mexico. Tepoztlán is just 75 km (46 miles) south of Mexico City and 17 km (11 miles) northeast of the popular colonial town of Cuernavaca, making it an easy day-trip from the capital, although a couple night’s stay is strongly recommended to appreciate it fully. At an altitude of 5,380 feet (1,640 meters) above sea-level, the town lies two thousand feet lower than the nearby capital, and its location in the region gives the town a divine climate, with warm spring-like temperatures most days of the year, mild winters, and long daylight hours through the seasons. This region of Mexico is rich in natural energy sources—with nearby volcanoes, fertile vegetation, rivers and lakes, waterfalls, and springs of mineral water. It’s no wonder then that Tepoztlán is one of the top places in Mexico visited by people seeking alternative therapies, Aztec steam baths, healing, and health rejuvenation. It’s also well-known as the place in Mexico where most UFOs are sighted. The central attractions of the town include the beautifully preserved colonial ex-convent, the traditional mercado which opens daily just off the main square, the lively artisans market which sets-up every weekend, and the mountain-top pyramid El Tepozteco—said to be a focal-point of mystical energy and a place of spiritual importance. Tepoztlán has been designated as a ‘Pueblo Mágico‘ — a nationwide tourism program that seeks to highlight small towns with exceptional character. Tepoztlán offers visitors an excellent selection of hotels, B&Bs, and Spas to enjoy — including some of the country’s finest places to stay — as well as an ample selection of restaurants, eateries, cafés, and bars. The town is a popular get-away destination for Chilangos seeking weekend entertainment and recreation. As a result of the this, the town is much busier at weekends, and is particularly lively over holiday weekends and during certain annual festivals. 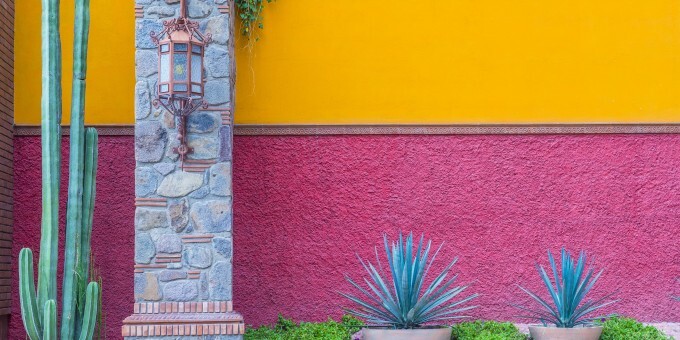 This vibrant mountain town is one of the most unique places in Mexico’s colonial highlands: whether you come for the day, or stay for longer, you’ll encounter the natural beauty, the peace, tranquility, and sanguine atmosphere as you meander its bucolic streets and alleyways and relax in the beautiful gardens of one of its fine hotels. Most people who visit remark on its tranquil serenity, and some speak glowingly about its mystic allure and how it compels them to keep returning. The Ex-Convento Dominico de La Natividad is the town center’s focal point; a beautifully preserved ex-convent and present-day Catholic church. Originally built as a convent and church by the Dominican order between 1560 and 1588 (you can still see the Dominican seals on the church’s façade), this grand building has been undergoing restoration, and is still used for church services and town celebrations. The principal points of interest in the complex include recently restored 16th and 17th century frescoes, a regional museum on the second floor, and an a charming gift and bookstore on the ground floor, near the exit. The monastery grounds include gardens to the front and this public area acts as the proxy for a town park; during the longer summer days families, friends, and couples can be seen passing time there. Particularly noteworthy is the main arched entryway to the monastery grounds: a mural composed of 60 varieties of seeds to form a pre-Hispanic scene which changes every September as part of the Festival of the Temple (see events, below). The ex-convent is open Tuesday-Sunday, 10 a.m. to 6 p.m., admission is free. Museo Carlos Pellicer houses a modest collection of pre-Hispanic art and archaeological remains from various Mesoamerican cultures including the Maya, Olmec, Zapotec and Totonac. The Traditional Town Market – Tepoztlán features a traditional market which opens every day of the week, situated adjacent to the town’s zocalo (main square) and municipal building. Besides the sale of fresh produce, meats, and dry-goods, you’ll also find a cornucopia of vendors offering all manner of general goods and supplies as the market is a principal shopping outlet for the towns’ residents. Also inside the market, you’ll find a wide selection of comedores (food stalls) offering tasty and authentic, freshly prepared regional and national meals. Weekend Artisan and Foods Market – Every weekend, Tepoztlán features an artisans’ market with stalls set-up along the town’s principal through-road, Avenida Revolución: the road is closed late on Friday and doesn’t re-open to traffic until Sunday night. This creates a pedestrianized zone for visitors and shoppers and provides an ideal opportunity to purchase genuine works of Mexican art and crafts, taste some local foods and, for the more adventurous, try a local specialty: Pulque—an ancient alcoholic beverage that is fermented from the sap of the Maguey (Agave) plant; while it’s related to Tequila, it has a milky color, thicker viscosity, and a sour – some might say acquired – taste. Posada del Tepozteco – One of Tepoztlán’s best hotels also offers magnificent views across the town and mountain valley from its garden terraces. (The photo in this guide shows the view from there.) Call-in for a while to take refreshment from the café-bar as you admire the scenic views and fresh mountain air, enjoy a meal at the restaurant, or stay a night or two (advance booking for accommodations is essential at weekends and during holiday periods). Piramide del Tepozteco is Tepoztlan’s landmark archaeological site. Built atop a mountain cliff that overlooks the town and the entire valley beyond, the temple was built circa 1130 AD in honor of Tepoztecatl, the Aztec god of harvest, fertility, and Pulque. The trail that leads to the top of the mountain ridge and the temple zone begins at the far end of an alley leading-off Avenida del Tepozteco. The way is characterized by a steady ascent over stone steps and rocky-pathways with resting areas every few hundred meters. Near the top is an iron staircase that leads straight up to the entrance of the archaeological zone, and where climbers are rewarded with stunning views of the town and valley in addition to the temple itself. There is a small store adjacent to the entrance offering bottled water and a range of sodas and snacks. The pyramid is open daily between 9 a.m. and 5:30 p.m. There is a modest entrance fee of about $50 pesos (take cash) everyday except Sundays when entry is free. Weekends are very busy, and Sundays are especially busy. If you plan to ascend at the weekend, we strongly recommend you get an early start on the climb (before breakfast), so that your ascent and your time spent at the pyramid is not marred by the weekend crowds. Mondays to Thursdays are quieter all-day as there are far fewer people making the climb then. Wear a good pair of comfortable walking or hiking shoes that will also support your ankles. Flip-flops and other footwear without good traction are not appropriate for this terrain: some of the pathway is paved, but there are sections where ground and rock are your only support underfoot. You’ll need to be reasonably fit to make the climb. There are rest-stops en-route, but remember you are starting the climb at an altitude of around 5,500 feet above sea-level, and you’ll be ascending an additional 1,700 feet or so over the course of a 1.5 mile hike. Take it easy ascending and descending and take a bottle of water with you to stay well-hydrated. Hiking Trails exist across the mountain ranges that surround the town and the valley, but most are wild, unmarked, and not regularly maintained. Ask locally for advice, or hire a local guide who knows the trails and can lead you on some of the more well-trodden paths to popular vantage points and natural attractions. During and shortly after the rainy season (June to October), paths can lead to little-known waterfalls and lagoons, providing a refreshing respite after a long hike. If you hike independently in the mountains around here, start early, take plenty of water, and plan to get back before nightfall: when the sun sets, the trails can become totally obscured to the naked eye; some lead to cliff-edge walls with sheer drops. The valley where Tepoztlán is situated has a long-held reputation for being a mystical location with natural energy and healing properties, and a small, thriving, cottage industry of health, well-being and alternative therapy services has become established here. You will find an abundance of relaxing and healing therapies to choose from ranging from massage, corporal energy work such as Reiki, and other New Age services such astrological and tarot card readings. The valley’s divine micro-climate, fresh mountain air, and spectacular scenery contribute to a general sense of well-being and serves as an ideal ambiance for receiving therapy. The town offers a number of higher-end comfortable hotels and spas offering these services, as well as traditional rustic spa and alternative therapy centers. Walk-in massage treatments—In town you can readily find offers for massage treatments (and related Temazcal sessions – see below). The quality of these walk-in centers varies widely, and we recommend you ask locally (perhaps at your hotel, cafe, or a friend) for a recommendation to avoid disappointment. Massage at spas—A range of massage treatments offered through local hotel spas where you should be able to find your preferred massage style such Swedish, hot stone, Thai, shiatsu, or reflexology; some establishments also offer facials, pedicures, manicures, and other aesthetic services. Some hotels also have Aztec steam baths on-site known as a Temazcal. Temazcal—An Aztec steam bath, known as a Temazcal, is an ancient indigenous healing therapy that is offered in multiple places in and around Tepoztlán. Participating in a Temazcal session usually involves a group ritual where the participants enter into a low-lying dome structure (similar to an igloo) in which a fragrant steam bath is produced by pouring a mixture of mineral water, herbs, and natural oils over very hot stones. A traditional Temazcal is usually performed in small groups as a spiritual cleansing ceremony in addition to being a physical cleansing. Private sessions where only you, your partner, or your close friends or family are present can also be arranged. Yoga—This traditional Indian-style meditative exercise has become popular world-wide and has been extensively practiced for decades in Tepoztlán. There are plenty of opportunities to participate in Yoga sessions at local independent body-art centers like ‘El Amate,’ as well as at hotels and spas situated in and around the town. Wellness and therapy boutiques—Tepoztlán is well known for its wellness and therapy boutique stores, sprinkled across town and offering a range of lifestyle products and services. Some, like Corazón Sonoro, offer a fusion of bistro, products shop, as well as hosting talks, musicians, and practical workshops about wellness and alternative lifestyles. Some of the boutiques open all week, but most are only open between during the weekends when visitors fill the town. By Air – The two nearest airports to Tepoztlán are Mexico City and Cuernavaca. For detailed information about flights and flying, see the Mexperience guide to Air Travel in Mexico. By Bus – First-class buses run regularly from Mexico City’s southern bus terminal (Taxqueña) directly to Tepoztlán between 6 a.m. and 11 p.m. daily; the trip takes around an hour-and-a-quarter (depending on traffic). Buy tickets at the Pullman de Morelos kiosk at the bus terminal. Buses are signed to Yautepec or Cuautla and make their first stop at Tepoztlán. If you don’t want to travel across Mexico City from the airport to the southern bus terminal, you can board a bus from Mexico City’s main airport directly to Tepoztlán—but note that this service is very limited, so a Uber or Cab ride to the southern bus terminal might be a better option. For detailed information about bus transportation read the Mexperience guide to Bus Travel in Mexico. By Car – Driving to Tepoztlán is fast and efficient with the roads and toll roads that connect the region. Leave Mexico City on highway 95D (tolled) towards Cuernavaca and Acapulco, turn-off before Cuernavaca on road 115D signed to Oaxtepec, Cuautla and Tepoztlán. See additional information about Driving in Mexico and Mexico’s Toll Roads here on Mexperience. Car Rental – To explore Mexico’s colonial towns and cities, consider renting a car for your visit. Having your own car will give you more flexibility than using public transport options and, in some cases, offer you access to places which are otherwise difficult to visit without the use of a car. Read our guide to Car Rental in Mexico. Taxis – Taxis in Tepoztlán are not metered, so agree your price beforehand. There are taxi ranks situated at the main bus stop, in the center of town, as well in all of the local neighborhoods. Your hotel or B&B can call one of the local cab firms to arrange transportation for you. There is currently no Uber service operating in Tepoztlán, but Uber services operating in nearby Cuernavaca will travel to drop-off passengers in Tepoztlán. For detailed information, read the Mexperience guide to Taxi Travel in Mexico. El Carnaval de Tepoztlán—On the five days preceding Ash Wednesday each year, the town celebrates its own Carnaval season featuring Chinelos and other festivities. Chinelos are traditional costumed dancers associated with the local region; these dancers are garbed in decorative headgear that is a blend of indigenous and Catholic traditions. During its Carnaval, the town hosts a major market and fair, churches put on special services, and fireworks can be heard throughout most days and nights during the week. Local people from all of the satellite towns and villages surrounding Tepoztlán also come to celebrate during the Carnaval. Fiesta del Templo (September 7 and 8)—Historically, the indigenous inhabitants of this region paid homage to the god of “Pulque” with an all-night drinking festival. Catholic purists tried to discourage the practice by supplanting the date with a Christian festivity honoring the conversion of the inhabitants to Christianity. In-keeping with Mexico’s proclivity to combine foreign and indigenous traditions, today the locals celebrate both festivals back-to-back, with the Christian version featuring theater performances and the re-creation of the seed-mural on the monastery’s main archway. Day of the Dead (November 1st and 2nd). Day of Dead is one of Mexico’s most important religious holidays, and it’s energetically celebrated in Tepoztlán. You’ll see ofrendas (altars with offering to the deceased) in shops, restaurants, and local homes; and the local cemetery, which is overlooked by the impressive Tepozteco mountain, fills with color and families who attend the graves to celebrate the lives of loved ones who have passed. Telephone: Tepoztlan’s telephone area code is 739. Connect to the guide about Communications in Mexico on Mexperience for detailed information about keeping in touch and a table of national dialing codes. Exchanging Currency: Banks with ATM machines are found in the downtown area of Tepoztlán. For detailed information about exchanging and managing your money, read the Mexperience guide to Money in Mexico. Internet Access: Internet cafes can be easily found in colonial towns and cities across Mexico and complementary WiFi is commonplace—from cafes, shops, and hotels. Tepoztlán also offers 3G and 4G mobile data services over various cellular networks. Tepoztlán features an extensive street market at weekends offering a range of authentic Mexican arts and crafts. The town is also host to a range of quaint boutique gift shops, situated in and around the center which sell higher-end arts, crafts and unusual gifts—most are only open between Friday and Sunday. Pulque—an ancient alcoholic beverage that is fermented from the sap of the Maguey (Agave) plant—is popular here and you’ll see a number of street stalls offering the drink for sale at weekends. Tepoztlán enjoys a divine micro-climate that offers visitors and residents year-round mild and pleasant temperatures, and at least 10 hours of daylight every day of the year. The climate is ideal for taking part in a variety of outdoor activities and enjoying outdoors living. The rain season runs from June to October each year, with afternoon monsoon storms that drench the countryside, leaving the evenings dry and cooled off after the hotter summer days. Winter evenings and early mornings can be cool, so pack some warm pullovers if you’re visiting during the winter months.